The basic concept of the dependency injection (also known as Inversion of Control pattern) is that you do not create your objects but describe how they should be created. You don’t directly connect your components and services together in code but describe which services are needed by which components in a configuration file. A container (in the case of the Spring framework, the IOC container) is then responsible for hooking it all up. Lets we have two classes-Car and Engine.Car has a object of Engine. There are many ways to instantiate a object. A simple and common way is with new operator. 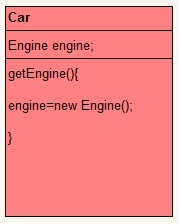 so here Car class contain object of Engine and we have it instantiated using new operator. Now we outsource instantiation and supply job of instantiating to third party.Car needs object of Engine to operate but it outsources that job to some third party. The designated third party, decides the moment of instantiation and the type to use to create the instance. The dependency between class Car and class Engine is injected by a third party. Whole of this agreement involves some configuration information too. This whole process is called dependency injection. How this whole dependency injection works,we will see it in further posts. Ensures configuration and uses of services are separate. Can switch implementations by just changing configuration. Enhances Testability as mock dependencies can be injected. Dependencies can be easily identified. No need to read code to see what dependencies your code talks to. Setter Injection:Setter-based DI is realized by calling setter methods on your beans after invoking a no-argument constructor or no-argument static factory method to instantiate your bean. Constructor Injection:Constructor-based DI is realized by invoking a constructor with a number of arguments, each representing a collaborator. Inteface Injection: In interface-based dependency injection, we will have an interface and on implementing it we will get the instance injected. We will see above injection type in further posts. In next post we will see spring hello world program in spring. it s simple to understand. i was checking thru various websites but cudnt understand them.. hav to learn springs in a day for simple projects… thanks a lot fr making a simple way for learning concepts..
very nice post..its really help for beginners.